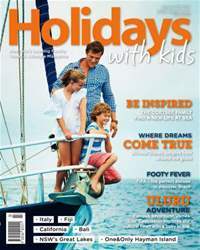 Welcome to the Autumn edition of Holidays with Kids with 178 pages brimming with exciting ideas for your next family holiday. This issue we are inspired by a family that sold up the family home and set sail to see the world and another that hit the road to explore Australia’s outback. Professional explorer James Castrission joins our team as a regular contributor and takes his family on an adventure in the red centre. We also bring you reviews on the most enchanting toy stores around the world, we take a look at visiting Brazil for the world cup, venture into the New Zealand and Japanese snowfields, look at all that is new in all the Disney theme parks and give you lots of inspiration with our caravan and camping section and family running festivals.